Eritrea may become a failed state if the world community fails to engage with the Horn of Africa nation, a think-tank has warned. The International Crisis Group says Eritrea is under severe stress, with the economy in free fall. Its authoritarian political system is haemorrhaging legitimacy, it says. But an adviser to Eritrea's president rejected the findings, telling the BBC the country had made tremendous progress since it was formed in 1993. After a long battle for independence, Eritrea has fought two conflicts, including a border war with Ethiopia in which some 80,000 people were killed. Last year, it became the target of UN sanctions for its alleged support of Islamist rebels in Somalia. It suspended its membership of the African Union in protest, and has become increasingly isolated. The ICG's Mark Schneider said if things continued as they were, the situation in Eritrea was "in danger of implosion" - a marked deterioration from the situation 10 years ago, when Eritrea was challenged but stable. "There are fissures within the military, growing dissatisfaction and exasperation amongst a significant portion of the population," he told the BBC's Network Africa programme. This has been reflected in huge waves of refugees leaving the country and also signs of internal discord, he said. "It's unlikely that the stability that has come as a result of the authoritarian rule of the past is going to be sustained." The report warns that national service, intended to develop and build the country, could prove one of the catalysts for the regime's eventual collapse. 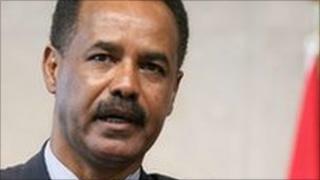 However, Yemane Gebreab, adviser to President Isaias Afewerki, said the report undermined the ICG's credibility. "I think the situation in Eritrea is quite positive, quite promising. There is quite a strong trust between people and government in Eritrea," he told the BBC. "We have made tremendous progress in health, in education, in women's empowerment in Eritrea. "The economy is looking up; investment is coming into Eritrea, quite high levels of investment." According to the ICG, Eritrea needs outside help on the basis of greater understanding of the country's grievances.